The E7 is currently the only elliptical machine offered by Landice, a brand known for high quality, gym-level exercise equipment. Still, if you can afford the steep price, around $3000 with the basic console, it's a great machine that will last for years. The Landice E7 comes with 4 control panel options: the base Pro Trainer, Pro Sports, Cardio Control and Executive Control, offering different functions and capabilities. 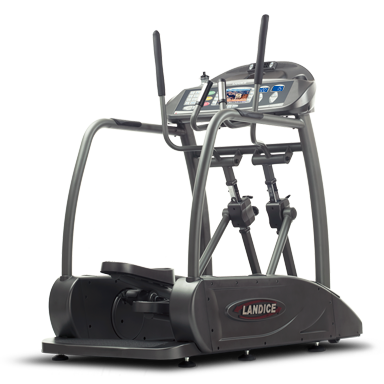 Unit weight/footprint: 500 lbs/ 35" x 76"
The Landice E7 elliptical has received high ratings from top consumer magazines as well as industry experts and fitness instructors. It is a very high quality machine with some nice features. It's built strong and is similar to the elliptical trainers you'll find in your gym. The most appealing feature is the fact that you can choose the console that appeals most to you. The standard console is called the Pro Trainer, a very basic LED display showing calories, speed, distance, time and pulse. There are 5 built-in workout programs with 20 levels, both wireless and grip heart rate monitoring and 2 user profiles. Moving up you have the Pro Sports console, which is an LCD display with a numeric pad and 5 user profiles. You then have the Cardio console, which is very similar in appearance to the Pro Sports control panel. It features additional fitness tests and heart rate programs. Finally you have the top-of-the-line Executive panel, with a video viewing screen on which you can select your own scenery. It has additional workout options as well. The base Landice E7 with Pro Trainer control panel will cost you around $3,095. It moves up from there, to about $4,495 for the Executive console. All models feature a very generous 17" to 23" adjustable stride, which is ideal for all users. Footpads have orthopedic gel inserts which makes them very comfortable and minimizes impact. You get a reading rack, powerful speakers, iPod and iPhone integration, water bottle holder and fan. The E7 is very well built and has a low step up height for easy access. It can withstand a user weight of up to 500 lbs. Do you need to spend over $3000 on an elliptical for your home? Of course not. Will you be happy if you do buy one of these machines? Absolutely. Landice makes very high end exercise equipment, and their residential models are as close to commercial as you can get. This is a monster of a unit at 500 lbs., so you're getting a very serious trainer here. There is also an option for a Landice Vision System, a 19" LCD TV that you can attach to your elliptical, for an additional $800 or so. But if you already have a flat screen in your gym area, you obviously don't need that. You can order directly on the Landice site, or you could check specialty stores like Leisure Fitness if there is one by you. It might be called an elliptimill, but it is the same product.